My mum’s surname was Frail. It is a nuisance item for family history because it is often mis-transcribed as ‘Trail’; and it is also a nuisance in the Google department because it is a real word, and newspapers quite like it in headlines as it has only five characters. There again, as a surname it is very rare – only about 120 in the 1911 census. I generally think to myself I have explored all the possible outcomes, and that dead ends should remain cul-de-sacs. But I never did know much about my Mum’s family, and she didn’t want me to find out. Her father Ernest had been brought up by a maiden great-aunt (‘a chapelkeeper’ – his grandmother’s sister – it must have been an austere existence), rather than his parents, who opted to ‘keep’ his younger sisters. An unusual choice. His grandfather had been a mariner (I knew that) and so had his father – but his father was allegedly unemployed. (He is certainly at home in the censuses, whereas his father was away, every time.) My mother was handed the first name of the chapel-keeper, Grace; her elder sister was awarded the other two sisters of the grandmother, Mabel and Eleanor. And the first James Buskin Frail, or rather the first in direct line of ascent, had quite a story. Here it is. I hope not too many references are in-family ones. JBF2: James Buskin Frail [father of EBF] and Richard Broom Frail [father of Francis Robert Bernardi Frail]. When you are a master mariner and lose or damage a certificate, you are in breach of regulations, and you are in danger of losing your livelihood. So the first thing you need to do is to replace it. This involves a fair amount of bureaucracy – which is the only reason I have managed to find out more about my grandfather’s grandfather, a man only rarely visible in a census – he’s at sea. I knew a little; but there is a story I have uncovered that oddly leads to his being named in Hansard; and to an understanding that anyone descended from him and his wife and his son of the same name, is lucky to be here. We nearly weren’t. JBF1 was born in Southwark/ Camberwell in 1824, the son of Joshua Jones Frail, a wiremaker, who was in turn the son of Thomas Frail, a brickmaker, and his wife Ann. There are not many Frails in England in the 1841 census, and there are three significant family groups, all probably related: Burslem in Staffs; Portsea Island in Hants; and Camberwell/ Greenwich/ Southwark. It is likely that they all come from the same stock, and that the name Frail is Irish (the name Friel is a significant variant, as in Anna Friel). The Portsea family definitely had Irish roots. At some point, the name Buskin has acquired significance, perhaps actually the names ‘James Buskin’ have acquired significance. I don’t think I will get to the bottom of this, but it seems likely that Ann Frail’s original surname was Buskin, and that her father or grandfather was called James Buskin. She calls her first son Joshua Jones Frail; but the later one is called James Buskin Frail, another wire-maker who drifted to Bristol. So when JJF had his first son, in 1824, he called him perhaps after his grandfather, or otherwise certainly after his brother: James Buskin Frail. There are two mysteries about JJF. The first is why he was apparently required to marry the same woman twice. The second is why he chose to move to Sunderland. His first wife is a widow called Elizabeth Johnson, and he marries her in St. Mary Newington in 1821. James is Elizabeth Johnson’s child. So too is an Elizabeth, born in 1826 (on whose birth record is the first appearance of ‘wire worker’, regardless of the reference to bricks below). But the next child, his sister Susannah [a very popular Frail name] would appear to be by a new wife, as she was born in June 1834, about six weeks after JJF married another Elizabeth, also a widow, in Clapham. Her previous married name was Field. One of the witnesses was called William Guidott. 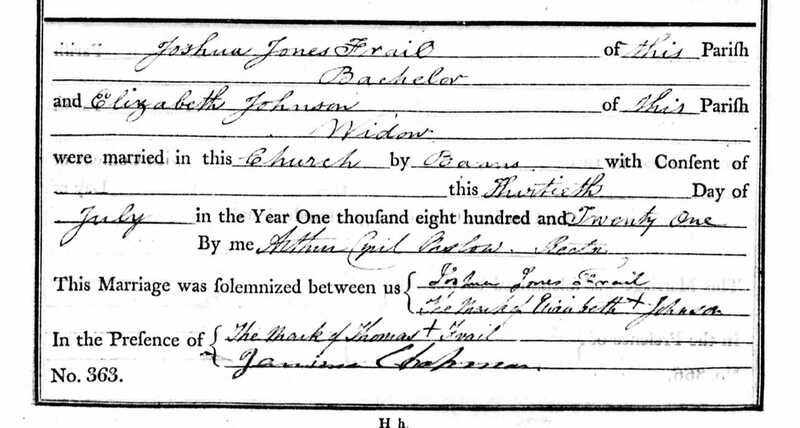 However, just to keep us on our toes, JJF marries again, in 1841. What is genuinely puzzling is that he marries the same or another Elizabeth Field (née Houghton). I can think of no clear reason why anyone should marry twice, each time in a church; but logic goes out of the window with family history. I’ve never seen this elsewhere. And the Guidotts from Marriage 2 are still involved with the Frail couple rather later (1873), and that suggests that the two Elizabeth Fields are one and the same. Another insoluble mystery. I assume there is a technical fault with the first marriage. Note that they even give separate addresses at the time of the re-marriage! I have never seen a second marriage like this. Any suggestions? At this point, JJF and Elizabeth Frail move to Sunderland. 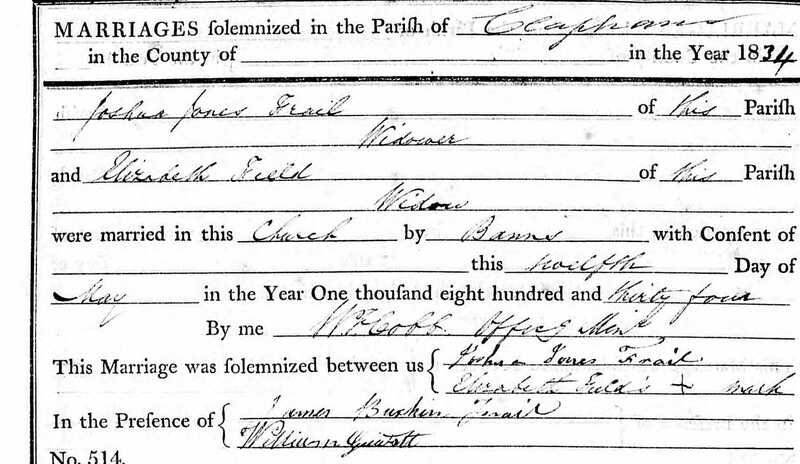 JBF1 marries in Sunderland in 1845, so it must be at about this stage. The question, why Sunderland? It may just be logic – where the work is. Wire-working is a specialism that would come in handy in a ship-building town on the up. There is at least one Frail in Monkwearmouth when they get there, as there have been others in Southwick. There is even a curious individual called Frail who is born in Sunderland, but who by 1861 is in a prison… on Portsea Island. It is also possible that JBF1 went first. He was not there long before he was married to Elizabeth Broom (1846). The Brooms were an established Monkwearmouth family. 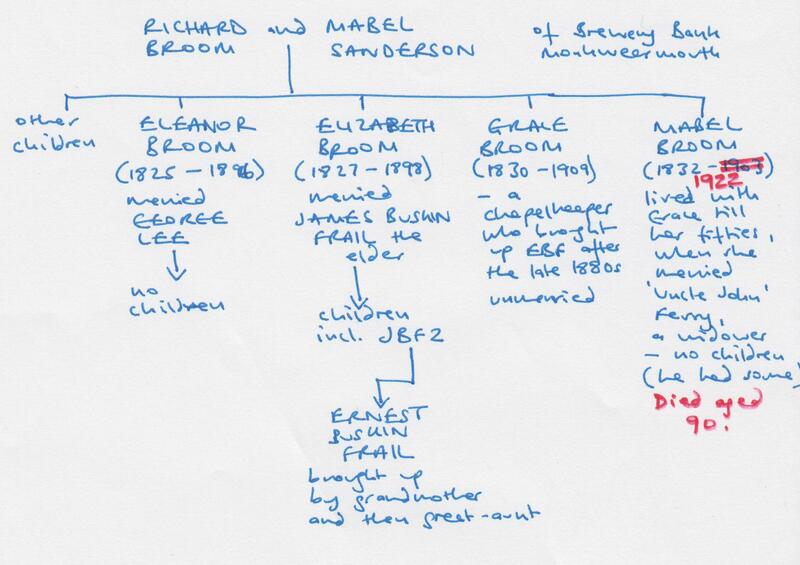 They appear as early as the 17th century; Eleanor’s father was called Richard Broom, and descended from a Humble Broom – the side effect of a Broom-Humble marriage in 1761. Richard’s father, another Richard Broom, had some kind of status: he leaves a will in 1802, and is described as a yeoman. Elizabeth Broom came from a family that had suffered more than its share of infant deaths. She had three sisters surviving: Mabel and Grace and Eleanor, and a brother, Richard. She had other brothers. Eleanor and Mabel and Grace had no children – although Eleanor was married in 1849 to George Lee, a shipwright who had been born in 1816. Grace was a chapel-keeper; Mabel, three years younger, lived with her. When she was over 50, Mabel suddenly married a widower, a carpenter called John Ferry. (My uncle, Jim Frail, asked me not long before his death where ‘Uncle John Ferry’ fitted in. He appears in a couple of Jim’s photos, a cheery, eccentric OAP. I didn’t realise what had happened until now. 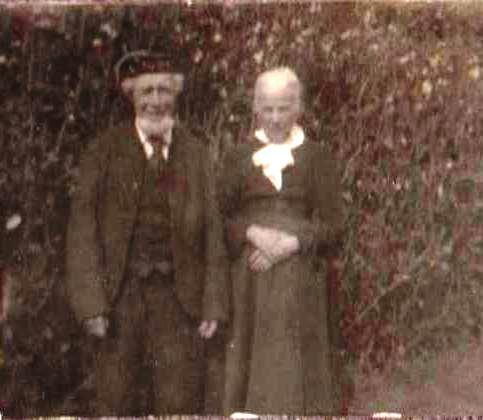 John and Mabel Ferry moved to the same area in Gillingham – round the corner – where my sister Clare lived before she died. It is hard to believe that Mabel’s flight into marriage was anything other than shocking, but perhaps I am being melodramatic. They would have been at home in Gillingham, too. Local streets were designed by a Sunderland architect to look like Sunderland. Jim still had some wood that had been cut by John Ferry.) Sunderland – and Monkwearmouth especially – were non-conformist. The biblical names Susannah and Joshua suggest that Frails were, too. The name of JBF1’s son in 1865 suggests they were Baptist (oddly enough, the Greenwells across the river were also Baptist). Mabel – often spelled Mable, by the way – lived to be 90. She could well have met Jim – who also lived to be 90. Her husband John died in 1913 at the age of 81, in Gillingham. ‘Uncle’ John Ferry and Mabel nee Broom. About 1909? Note his rumpled appearance, and his hat – similar to the ‘carpenter’s hat’ made famous by Tenniel’s drawing of the carpenter in ‘Alice’ (who was in turn dreamed up on the beach at Whitburn, two miles at most up the coast from Monkwearmouth). After Mabel left, Grace took on or continued a new project: her great-nephew, my grandfather Ernest (EBF). He is living with her in 1891 and 1901. She died in 1909, after he married. She was fifty years older than him. An idle thought: the names Mabel and Grace (applied to EBF’s daughters) clearly come from these sisters. So why did the elder daughter get Mabel (the one who moved away) and the younger, nine years later, get Grace? 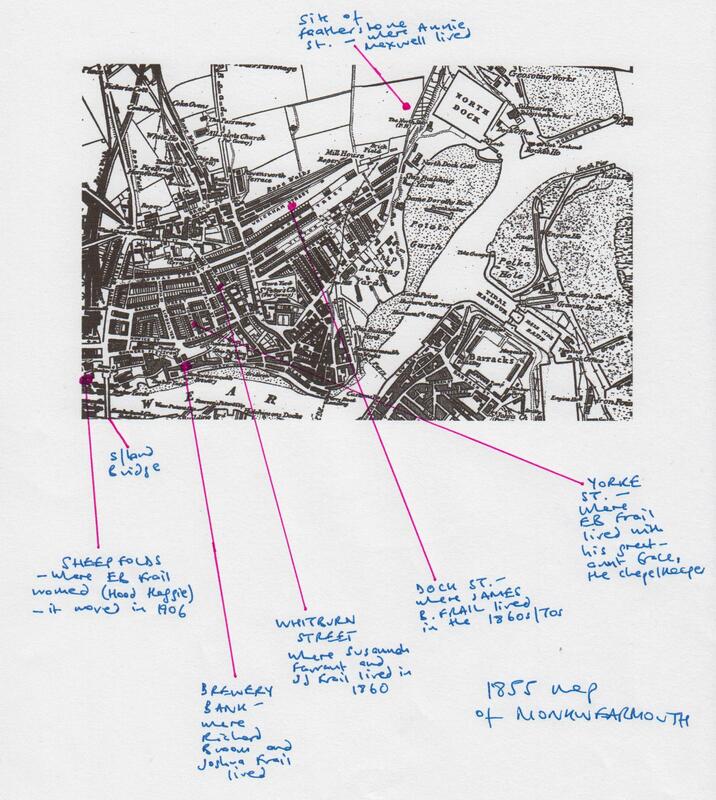 In 1841 and 1851, JJF and Elizabeth Frail were living on Brewery Bank in Monkwearmouth-Shore. JBF1 and his wife lived nearby, although JBF1 wasn’t often there. In 1861, when applying for his master’s certificate as a mariner, JBF1 had to provide a list of the ships he had worked on. It may be that this gives us a clue as to how he came to Sunderland – on a ship. As Elizabeth Broom lived in a seafaring community, her marriage to JBF1 would have been something she knew about, and it may have been what persuaded JJF and Elizabeth Frail to come north as well – with Susannah. 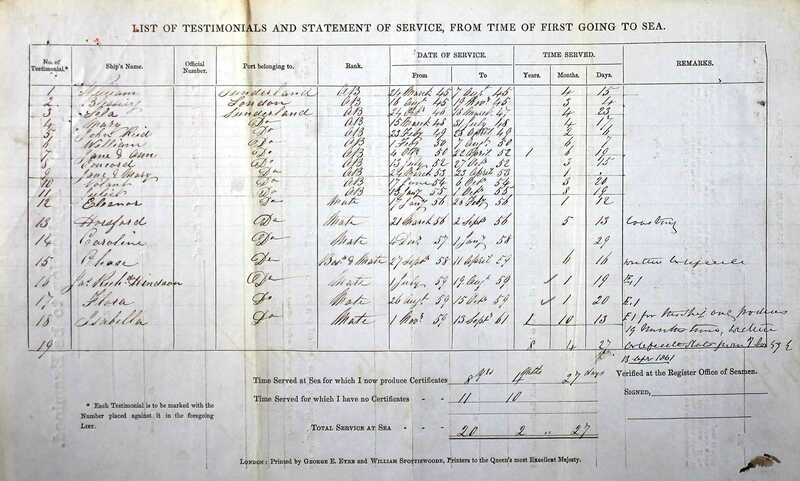 JBF1’s list gives you an idea of what a tough life a sailor had – as did his wife. During the sixteen years from 1845, when he first served, aged 21, as an able seaman, JBF1 clocked up over twenty years away. No-one seems to have complained about the odd maths that lets him use up 20 years in only 16: and he passed the examination, too. The only way to read this is to assume that he was at sea from about the age of twelve, which certainly sounds feasible. He was in Sunderland every Christmas and every spring, excepting those times when he was away for over a year, as in 1850-1852. And here is his certificate. This is a document he was to damage in distressing circumstances. JBF’s sisters Elizabeth and Susannah had both married, although Elizabeth does not seem to have come to Sunderland (I am fairly sure she married a bricklayer called David Webb, and remained in Camberwell all her life). Susannah was in Sunderland too, and had married a seaman/ naval volunteer called Thomas Farrant, in 1851. The next decade – JBF1 being hardly there – was filled with domestic disaster. The easiest way to do this is to look at the pattern of Susannah and JBF1’s families together. 1849 JBF1 and Elizabeth Broom have a daughter, Eleanor. 1851 Eleanor Frail dies at 18 months. 1851 Susannah marries Thomas Farrant (he is from Essex). She is 17. 1851 Son Thomas Farrant born. 1856 Daughter Elizabeth Farrant born. 1856 James Buskin Frail the second born (JBF2). 1859 Ann Isabella Farrant born. 1861 Richard Broom Frail born. 1861 Joshua Frail Farrant born. Now it starts to go wrong. 1862 Joshua Jones Frail dies, of typhus. He is 63. 1863 George Lee Frail (named for his uncle) born. 1863 Elizabeth Farrant dies, aged 7. 1864 Susannah Farrant is born. 1865 Joseph Graham Frail born (has to be proved this is correct, but I know of the descendant of Baptist preacher Joseph Graham who lived in the nearby street). I suspect he died that year. 1866 Betsy Frail Farrant is born and dies. 1866 Susannah Farrant dies in childbirth, aged 34. 1868 Thomas Farrant dies, aged 14. 1868 Thomas Farrant marries again to Hannah Rowe. 1868 Hannah Rowe Farrant has a first child: Mary Hannah Farrant. 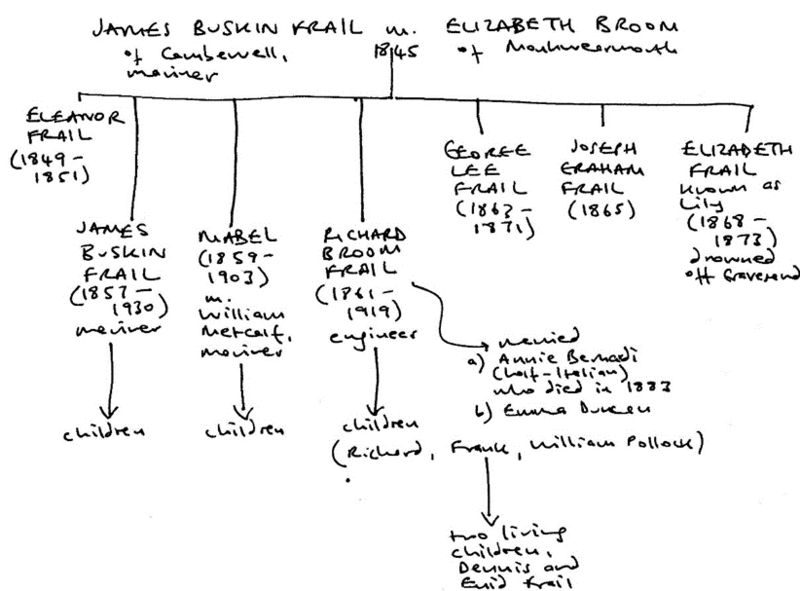 1869 Elizabeth Frail is born. She is known as Lily. 1870 Hannah Rowe Farrant has a second child: Thomas Rowe Farrant. It’s 1871. The Frails have lost two, perhaps three children. They have JBF1, Richard, Mabel and Lily left. The Farrant children are orphaned, and two have died. Ann, Joshua and Susannah remain, with two new half-siblings. This is how the 1871 census stacks them up. At 1 Waterloo Place, Monkwearmouth, Thomas Farrant is away at sea. His new mother-in-law, Elizabeth Rowe, has Thomas’s children Joshua and Susannah from his Frail marriage, and another grandson from another daughter, called John McIntosh. Above them is Hannah (Rowe) Farrant. She has Annie, her stepdaughter, with her; and her two young children Mary and baby Thomas with her – and a nurse called Mabel Caress. She will have three more children in the next four years. Thomas was to die at the age of 14, and a subsequent brother, when he was 23. Joshua Frail Farrant is never recorded on any index after this. At 25 Dock Street East, Monkwearmouth, James Buskin Frail senior is away. Elizabeth is downstairs with JBF2 and Mabel, Richard and little Lily. At 27 Society Lane, Monkwearmouth, Elizabeth Frail, JJF’s widow, formerly of Shoreditch, is on her own. 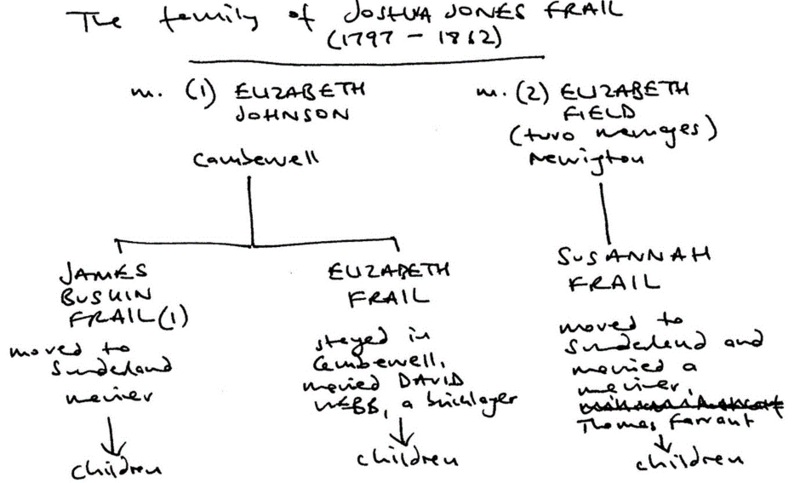 In 1872 JJF’s widow, Elizabeth Frail, dies, aged 81. 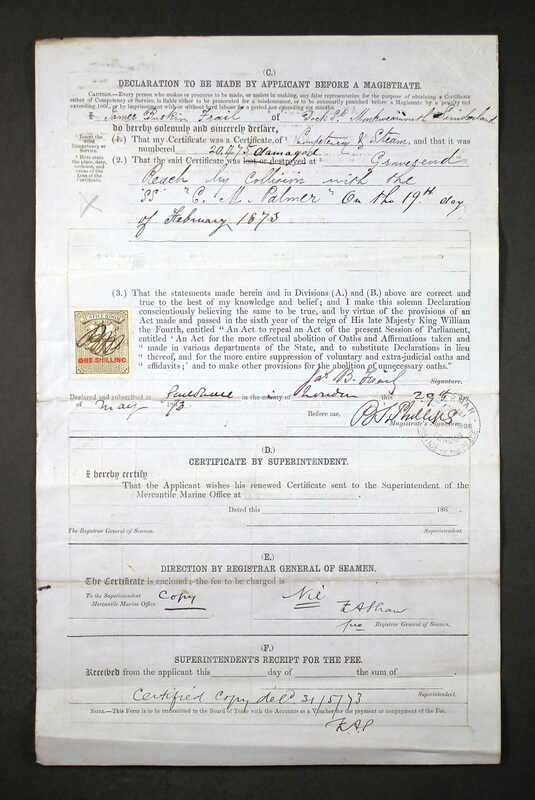 James Buskin Frail – JBF1 – is abroad in 1872. Master of his fourth ship – the “Larnax” – he spends from February 1872 to January 1873 taking cargo to Singapore and New York. When he comes back, he and Elizabeth have an idea, and it is at this point that his life goes just a little crazy. The “Larnax” is a barque, a sailing ship. He takes his family – the two sons, the daughter, the little girl – on the ship, together with some paying passengers. Also there are some nephews of his wife – the children or grandchildren of William Guidott (last seen on the 1834 marriage certificate as a witness), including the lithographic artist John Guidott, who is 21. (I can’t work out the precise relationship, but it may be that Elizabeth Field’s sister married a Guidott.) There are thirteen aboard. The youngest, Lily, is three. The boat is set for Mauritius, but it does not seem likely he was attempting to take his family with him. It is February 19th, three days after his birthday, and it is in the early hours. They are at anchor off Gravesend, and the fog is thick. James Frail goes into the belly of the ship to be with his wife and daughter. Out of the fog comes another ship, a steamship, a Tyneside ship called “C.M. Palmer”, named for the joint boss of Tyneside’s Palmer’s yard. The apprentice at the wheel shouts “Steamer coming into us, Captain Frail!” and, just as the men get to the deck, it smashes into the fore-rigging. There is a violent crump as it hits the “Larnax”. There is nothing to do but to abandon it. Torn between two impulses – Lily and the ship – he takes the three-year-old with him as he tries to see if he can stop the boat from sinking. In the fog and the dark he hears someone shouting: his nephew, John. John motions to Lily. He’ll take her. James Frail sees this, understands it, feels a relief. John takes Lily and hurries into the dark. Now he guides his wife, his mate, and the apprentice up the rigging to the boat. He waits till the last of the ten minutes they have until he allows the steamer to rescue him; he stays with his ship as long as he can. On board the “C.M. Palmer”, he sees his wife. She asks him where Lily is. And has he seen John? Only then does he realise that neither John nor Lily have been seen again – they have drowned after trying to climb the rigging and falling. The ship’s steward (cook), a man called Boucher, is also missing. Her body is not discovered for ten weeks. His nephew’s body is buried at a local chapel; Boucher is also accidentally buried, and has to be exhumed for an inquest. This coroner’s court comes out very firmly in favour of James Frail. There is an inquiry, as there must be. The Admiralty inquiry finds against the “C.M. Palmer”. But in May there is an appeal to the Privy Council, and Palmer’s has the decision reversed: a technicality. No light being shone, against regulations. The case finally returns to a tribunal in June, and the focus is all on whether or not the “riding-light” was lit. (Curiously, a Hull paper, one of many from Portsmouth to Liverpool that feature the case, notes in its first report how bright the riding light is. This looks very much like a reporter being nobbled. The other newspapers are mostly in agreement, but prone to being wrong. One – and I have seen 11 – says the son has died.) There is a right royal compromise (stitch-up) at the end of the third session, a Board of Trade enquiry: “After giving this extraordinary case their best consideration, the court is of the opinion that both ships were more or less to blame, but under the very special circumstances, to which they need not further refer, they do not feel justified in dealing with the masters’ certificates.” The certificates are returned to the masters. The end result is a side-effect of the case exciting a fair amount of public interest. The Devonport MP, Montagu Chambers, an ageing defence Q.C. at the end of his parliamentary career, and his life, asks the President of the Board of Trade in the House of Commons whether he will place upon the Table of the House the Minutes of Evidence taken by the Shorthand Writer at the recent official investigation by the Magistrate, assisted by the Nautical Assessors Captain Harris and Captain Oates, at Greenwich Police Court, into the circumstances of the collision between the screw steamer “C. M. Palmer” and the barque “Larnax,” on the night of the 19th of February last, in Gravesend Reach, which resulted in the loss of three lives: viz. Lily Frail, the captain’s daughter (of the “Larnax”), Thomas R. Boucher, the steward of the “Larnax,” and John Guidott, visitor on board the “Larnax,” together with the official report or decision of the Magistrate and Nautical Assessors? He gets a coded reply, saying it is sub judice. Chambers obviously smelt a rat, and his intervention plainly is a coded piece of advice to the board of trade: let Frail off. It works a charm, despite the political dissimulation. 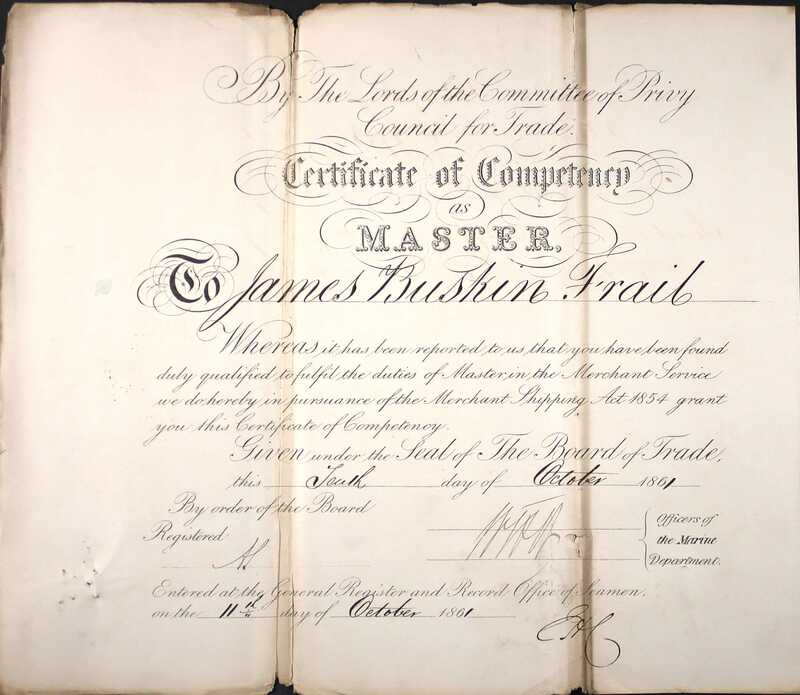 James Buskin Frail realised his master’s certificate was damaged. He explained how it happened, and received a replacement. The name “Larnax” was transferred to a steamship, and James B. Frail gained its command. In 1877, he was described as returning the boat to London from Singapore. At some point, he was relieved of his work probably in early 1878. In 1881, he is at home with his one-year-old grandson Ernest, and describes himself as unemployed. In 1878, the “C.M. Palmer” had gone down after a boat had ploughed into it in fog – the “Ludworth”. The master was suspended, and it was plain that his crew were not qualified. Several people were killed. A couple of months after the census, the “Larnax” went down in a journey between Maryland and Nova Scotia. It looks from Chambers’ threat of intervention as if it was widely agreed that there had been sharp practice in the Privy Council, but James Buskin Frail had no choice but to soldier on. There would probably have been a dent in his reputation, since, although there was sympathy for the death of his daughter, he had been, at the time of the collision, in the warm with his wife. He does not seem to have sailed after the 1870s. He died in 1895, at the age of 70. His wife followed three years later. 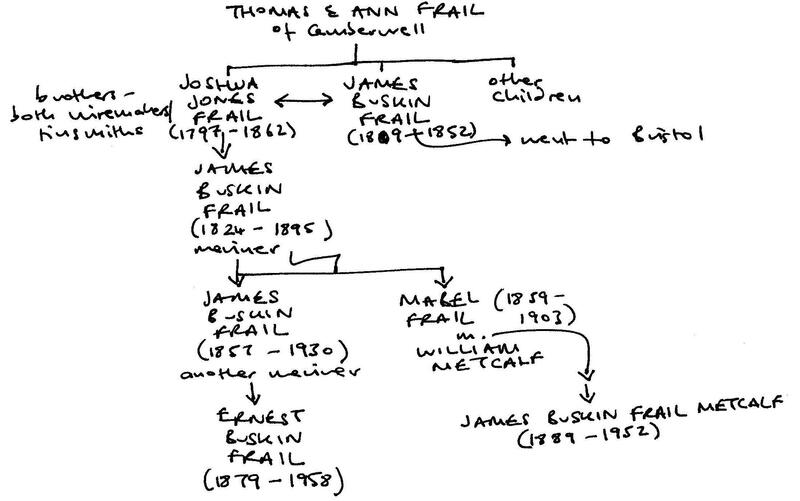 When his daughter Mabel married a man called Metcalf, she gave her son the name “James Buskin Frail Metcalf.” Many families of the time did, but the Frails seem to do it more than once: just look at the names of the two brothers: Joshua Jones and James Buskin. Or Richard Broom Frail, JBF2’s second son. Or Richard Frail’s twin sons, the ones whose birth killed his wife, Annie Bernardi. The first – who survived as Frank Frail – was Francis Robert Bernardi Frail. The second, who did not survive, was William Pollock Frail. William Pollock was a shipwright next-door neighbour to JBF2 in the 1870s. (This is why I think Joseph Graham Frail in 1865 is part of the same family; and there was certainly a Joseph Graham around: he owned a timber yard in exactly the same place as Joshua Jones Frail and Richard Broom lived – and by a fluke, his great-great-granddaughter has contributed to a colossal Sunderland web-site. Joseph Graham had also died just before this; and he was a local Baptist preacher.) As it happens, the Baptists across the Wear in Sunderland were Greenwell relatives. But that really is another story.